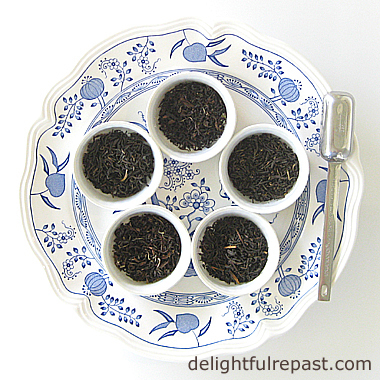 Why a photo of loose leaf black tea? Because it's the only thing I consume during the fast. Always interested in maximizing my health and preventing problems before they occur, I’ve always believed something Mark Hyman, MD, said so succinctly: The most powerful medicine is at the end of your fork. I do a bit of daily exercise, including weight training, to prevent the loss of muscle mass that starts occurring much earlier in life than you might imagine. According to WebMD: Physically inactive people can lose as much as 3% to 5% of their muscle mass each decade after age 30. Even if you are active, you'll still have some muscle loss. The other key to avoiding muscle loss is maintaining healthy insulin sensitivity. And that is what got me interested in intermittent fasting, specifically 16/8 intermittent fasting. Disclaimer: I am not a doctor of any kind, have no formal education in the field of diet or nutrition and would suggest that anyone who is under a doctor’s care for any condition should consult their doctor about dietary changes as their medication dosages will likely need adjusting. According to Dr Fung (see next paragraph), people who should not fast are those who are: underweight, malnourished, children, pregnant or breastfeeding. And if you’ve ever had any sort of eating disorder, consult your doctor. I'm not an expert, I’m simply telling you what works for me. But there is plenty of information out there from people who are experts. Here is a YouTube video of nephrologist Jason Fung, MD, being interviewed by Dr Mercola. Especially if you or someone you love is diabetic, please watch this video. This is not “a diet”—I don’t believe in temporary diets—it is a way of eating that can be done for a time or for a lifetime. So I spent months researching it before deciding to do it. I learned it has many benefits and is really quite easy to do. You can choose any 16 hours to fast, including however many hours you sleep. If you sleep 8 hours, that’s half of it right there. Since I had already stopped after-dinner evening snacking a few years ago, it was really just a matter of postponing breakfast until 10:00 in the morning. So I do all my eating between 10 am and 6 pm. This might mean packing a breakfast to have at work—something with lots of protein, not Starbucks and a donut! But no need to get obsessive about it. If the 16/8 schedule won't work for you some days, just make it 15/9 or even 14/10. It's all good! If this is something you think you might like to try but think it's going to be difficult, I'd just like to tell you it's really quite easy. If you like, you can build up the number of fasting hours gradually. It's compatible with any diet (vegetarian, vegan, gluten-free, keto ...), compatible with any schedule and doesn't require willpower. I'd love to hear your thoughts on fasting, dieting, nutrition and health. And don't worry, I'll be back with a really good comfort food recipe next week! My favoruite way to practice intermittent fasting. Usually no dinner and a huge breakfast for me..Good that you also do some weight lifting, which I think it's very important. When I had a Muslim child or children in my class I would usually get a letter from their parents or the parents would have a word with me after school to explain that their child must not eat or drink at school during the period of Ramadan. I would keep an extra eye on those children to make sure they were feeling OK during the day. I never had any problems with any child who had to fast. They always ate before sunrise and ate after sunset, and they would tell me what they had eaten, so I knew they were not starving. I have always made an effort to make a sacrifice during Lent. But. to put it bluntly, we all eat too much and often the wrong things. "Grazing," is never a good idea and yes, keep fit!! I did my run this morning, Jean. Ha! Ha! Angie, it's great that it's so flexible. Each person can choose her own hours and can change them at any time. I've been doing weight training for years, can't imagine what condition I'd be in without it. Tony, you're so right, grazing is not a good idea, at least not for me. I think the intermittent fasting also makes you more conscious of what, as well as when, you're eating. This sounds very doable. Thanks for sharing your research. I've tried Fast 5 in the past and 16/8 seems a lot more reasonable. We've been reading about this Jean since we saw some articles about it. We have already cut down to just two meals a day and try to quit eating by 6 pm. I didn't realize all the benefits until I read this post. My hubby and I will try to extend our hours of non eating by a little each week. Thanks for the info and push in the right direction. In my OSHO, one of the best articles you've published. I kid a lot – and I do eat quite a bit of sugar (which I believe my familial genes are programmed to handle better than most people) – but the truth is that my lifestyle and dietary choices have always been uncannily ahead of the curve when it comes to nutrition research and discoveries. I believe that if you are tuned optimally by exercise, your body is much more likely to signal you reliably for what’s healthy. So, your 16/8 has very much been a part of my lifestyle for the past one-third of my life. And because the extreme activity of my youth demanded it, I think eating early in the day was necessary then. But because my activity is relatively less now, I often don’t eat until afternoon. Lastly, many of the benefits you cite are also part of my rationale. Thanks for the special direction of this one: 5+ cleavers! Ellen, I haven't heard of the Fast 5, but if it has just a 5-hour eating window, that would be tough for me! Sugar, I'm so glad this was helpful to you. I hesitated to blog about it, but thought it might be helpful, so I took a chance. Sully, 5+ cleavers! I am deeply honored and always value your OSHO's. I plan to stay with this for life. Thanks for posting this Jean. I have been following your diet for 5 years now and it's great! Sure, there are exceptions, like when we go to a friends house or have them over for dinner. But then it's back to 16/8 the next day. Coffee in the morning helps me get to 10am and brushing my teeth shortly after dinner signals that I'm done eating for the day. It's really a great thing to do! Eating good whole foods on a 16/8 plan, exercising daily, and giving myself a full 8 hours of sleeping opportunity each night is the healthiest way to live in my opinion. Thank you, Zaa. I was hoping readers would find it helpful or interesting. It's a bit of a departure from (though it's not incompatible with) comfort food recipes! Richard, thank you. I'm so glad to hear you're doing this! It's something I know I'll still be doing 5 years from now, as it is so easy and has so many benefits. I usually get up at 5, so I have 5 hours to go before breaking my fast. But I have a couple of cups of tea and go about my business, and before I know it it's time to eat. Brushing right after dinner is such a good tip, especially for those just starting IF. This is really interesting, Jean. I'm assuming the fasting means liquids are OK, not solids? Thanks, Jeanie. Yes, water or tea or coffee with no add-ins (no sugar, artificial sweetener, milk, creamer, etc). Hello, Jean. Besides my family members - yours was my very first comment on my very first post so long ago December 2008! I was just glancing through my blog and came across your so sweet comment. Hope all is well. So happy to see you are still blogging ♥ Glad to find you again! Carrie, glad you're still blogging as well. It's hard to believe sometimes, isn't it? How interesting! Glad to see that tea can be consumed outside of the 8-hour window! Jean,that tea set is adorable...Hugs! Thanks for posting this Jean, I need to be motivated to at least stop snacking after dinner. I just read that if you eat late at night your body has a difficult time processing the food. Well Jean - that's a lot of helpful information we all need! Thanks for sharing and linking. Maristella, thank you. Love that pattern! Gerlinde, yes, if you do nothing else, stop snacking after dinner. Let me know if you notice a difference. Thank you, Bernideen. We call all this stuff we do "fighting decrepitude!" I've heard of this, but didn't know how to implement it. Turns out, I practically do it every day. I find it hard to eat early in the morning and always eat a late breakfast. I always wondered if this would affect my blood sugar. Nice to know it helps! Thanks for the great info! Morning...Love the cup and saucer. I don't take in a lot of sugar but bread is my issue. Carbs....need to back off them. I use sugar in my coffee only cause I have ran out of my Stevia and keep forgetting to pick some up. Keep on going....we should all be doing this. Karen, I'm glad you liked the info. Keep up the good work! I hope more people will implement fasting. Thanks, Pam. "Bread is my issue" made me smile because that's my thing, too. And I *make* bread at least twice a week! But, funny thing about this way of eating. It eliminates cravings, so it's easy to limit myself to one piece of bread or even skip it altogether. I have been doing The Zone way of eating for the past 18 years, Jean. I balance my protein, carbs and fats, and it seems to work for me. I know I do a lot of baking, but I really do watch when and how I eat. Kitty, I know I do a lot of baking, too; but that doesn't mean we eat all of it! :D The Zone sounds pretty balanced and, like any diet, is compatible with the Intermittent Fasting because IF is just about the timing. But if you're doing just fine, why change a thing after 18 years, right? We fast once a month for two meals and give the money we would spend to charity. Found you on Traffic Jam Weekend Link party. Candy, I'm glad you found me! Thank you for your comment. What a nice way to fast -- for charity! Very interesting info. John is type 2 diabetic. It makes cooking a challenge! Thanks, Mildred. That *would* make cooking challenge! I do hope John will listen to that video link. This doctor and other MDs I've listened to are curing/reversing, not just controlling, type 2 diabetes this way. Thanks, Carole. Yep, that's where you're going wrong! You can't count your fast as starting until you've finished your wine. Interesting post. I think it will be most helpful to people. I've heard of the benefits of fasting but never tried it. I believe in the 90-10 method, 90% food that is good for you and 10% treats to keep you happy. "Yes, it can be "all downhill after 30" if we don't fight it! :-)" Just read some of the comments on this article Jean.We must NOT frighten ourselves. Blimey. I am, what age I am, but I have never thought I was going down hill. Those who are over thirty are much better at long distance running for a start. Walking great distances is perfectly fine. Actually, what we need to do is just eat a balanced diet, drive less and walk more. Walking is brilliant. It is meditative and you have time to look at the world around you and notice small details and have time to ,see, people as opposed to being inside an artificial coccooned world of our own. Mentally, socially, physically walking is what we should all do. All these diets and fitness fads are destructive. Be positive about life and enjoy the company of others. Could I sell this concept? Amalia, I love that! :D That is pretty much the way I eat, but hadn't thought to put it quite that way. Tony, I quite agree. I think dieting and fitness fads are destructive. As you say, eat a balanced diet, drive less, walk more, be positive about life, enjoy the company of others. I think where most people who overeat go wrong is in "grazing," eating all through their waking hours. And then there are those who take intermittent fasting to the extreme of eating just one meal a day, which would not work for me. Balance is key to most things. Thanks for posting this informative post. I agree with you in controlling sugar intake and excessive snacking.. Thank you, T and T. I do love my treats, but as occasional treats! I never eat before 10am anyway so I think I might find this quite easy! Definitely something worth looking in to! Thanks for joining us at #TriumphantTales, hope you'll come back again on Tuesday! Thanks, Jaki! I hope you will look into it further, as it really has some wonderful benefits. Great article! Thanks for sharing with us at the To Grandma's house we go link party! Thank you, Tarah! Can't wait to see what you DIY next! Hope you are having a great day and thanks so much for sharing with us at Full Plate Thursday. Thanks, Kat! Of course, this way of eating is very sustainable (I plan to do it for the rest of my life) and results in fat loss on its own. Paired with some simple, but not extreme, calorie restriction, I think it would be ideal for those who want to lose a lot of weight. I'm so happy you've had such great success with intermittent fasting! What I love most is that it's very sustainable, and doesn't feel like you're starving or torturing yourself, which...eating food shouldn't! Exactly, Deb! It's such a small adjustment to make for such great benefits, as you said. Love your post, Jean. I am a big fan of Dr. Fung. My son reversed diabetes II after 13 years of suffering and it only took about 3 or 4 months to change everything. I think it is easier, like you mentioned to gradually increase the fasting hours. I like to fast 22 - 24 hours once or twice a week. It is a lot more helpful if we watch what we eat during the eating hours. Thanks for sharing, we will feature your post on the Blogger's Pit Stop to maybe help some more readers. Kathleen, thank you so much. I am glad, but not surprised in the least, that your son reversed his type 2 diabetes with intermittent fasting. I hope a great many more will read my post through the Blogger's Pit Stop and help themselves or someone they know on the road to health. Super informative post. I've read a lot about this, and it makes a ton of sense. It's a pretty sensible way to restrict calories -- which ultimately is what one needs to do to lose weight. But it seems healthier to me that an awful lot of the "miracle" diets that are out there. As you point out, it's pretty easy to make this a way of life. Really good stuff -- thanks. Thanks, John. The health benefits are amazing. It's not just for weight loss. Just be sure not to restrict calories if you don't want to lose weight! I've been thinking of doing this for a while, thanks for the tips. Sandra, thanks so much for commenting. I hope you will try it. I thought about it long and hard for several months. Once I decided the 16/8 method really made sense and would be sustainable for me for the long haul (for life), I went for it! Thank you for sharing this with readers. Thanks for sharing on To Grandma's House We Go! Thanks, Chas. I hope a lot of your readers will find it helpful. Thanks, Alice. I think 14 hours would be enough to get the benefits. Do let me know if you do it! Thanks for dropping by my blog Jean. This is an interesting concept, my husband and I are almost there but the downside is that we do like to eat late, 7:30-8 on weekends. Do you think you could change up the fasting times according to the schedule or does it have to be consistent to work? I generally don't eat after dinner anyway, just not good for sleeping for me. Eva, I don't think that would be a problem. Weekdays fast, say, 6pm to 10am; weekends, 8pm to noon. A little variation in the exact timing shouldn't be a problem. LOTS of comments on here about this Jean - it obviously struck a chord with all of us who are trying desperately to keep our midline under control. I'm writing a post in a few weeks about sugar and its evils (I noticed you stick to the 6 teaspoons a day recommendation) I've been doing the 16/8 since January (as you know) and I go 7pm - 11am and it works well. I haven't noticed any dramatic change in my weight or waistline, but if I remove a couple of hundred calories from my day and watch my sugar and do a bit of exercise, then I have to be on the right track! Thanks for weighing in on this, Leanne. And I'm confident that even if you're not noticing a big change in weight or waistline, what you're doing is having wonderful health benefits. I don't weigh, so can't comment on that; but I have noticed my jeans being a bit looser, and I attribute that to the loss of visceral fat, one of the benefits of IF. Hi Jean, I've only recently heard about this type of eating and my husband and I are unconsciously doing it. We both can't eat breakfast too early and prefer a brunch. I'm suppose we just have to eat by 6pm rather than 7 which we currently do. Sue, that's wonderful! I'm convinced this 16/8 is the way to go! LOL Yes, Annette, those hours while we're sleeping really help! I plan to stay with this eating schedule forever. When my health coach first suggested I try intermittent fasting, I was reluctant but I did anyway. I've been doing this for almost a year and it's great. I've lost belly fat and my digestion has improved. I have never experienced any weakness. I'm also on a 8/16 regimen, but I starte with 12/12. Like you say, people should consult with a doctor first, but intermittent fasting has worked great for me! I'll be tweeting this. Greetings from the Blogger's Pit Stop! Thank you, Fabiola. Tweets and all social media shares are much appreciated. I am so enthusiastic about this I want everyone to learn about it! I'm so glad to hear it's working so well for you. I was interested to read your post, Jean, as I've been hearing a lot about intermittent fasting and it's always good to get a first hand account. It's not something that would work for me as my husband's work schedule means that breakfast is very early, and we can't eat dinner any earlier than 8pm (and sometimes it is much later) but I have several friends who are finding it very effective. I'm glad that it is working for you, and I'm so happy you shared this measured, thoughtful post with the Hearth and Soul Link party as I'm sure it will help those who are thinking about what is turning out to be a very effective way of staying healthy and regulating weight. Have a wonderful week! April, thank you so much. I appreciate your detailed comment. 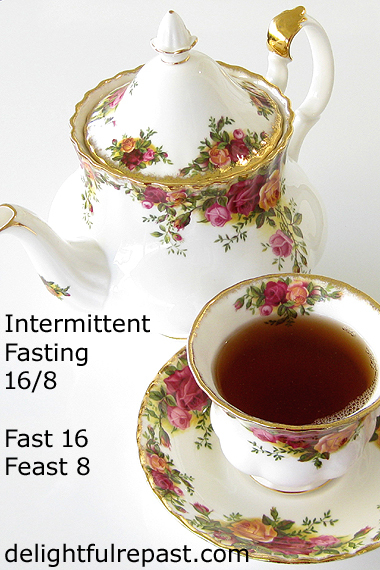 The thing about the 16/8 Intermittent Fasting is that it can work with *any* schedule. For you, that might be fasting from 9pm (after dinner with your husband) to 1pm the next afternoon. Breaking your fast at 1pm, having a small meal with protein at 4pm (teatime! ), then dinner at 8pm. I love that so many people are wanting and willing to give IF a try. My partner and I have had success with the 5/2 IF plan. We eat regularly 5 days a week and then "fast" two days per week. The fasting days mean consuming 500 calories for the day for women, and 600 calories for men. I personally stretched my 500 calories throughout the day, while my partner did his 600 in one meal. And we both lost weight and feel much better. I hope more people give it a try and realize how easy it really is. I like IF because I can press pause on it for special occasions and/or the holidays, and I'm not beating myself up or feeling guilty, because it's so easy to begin again. Bravo to all! Thanks, daddis. It's so flexible and doable. With either 5/2 or 16/8, each person sets his own schedule. So anyone can do it! I just recently heard about intermittent fasting from a coworker of mine. She only recently started, so I can't really say how it is going for her. As with all things new, my mind is thinking of all the reasons it wouldn't work for me. :-) On the mornings I exercise, I feel like I need a little fuel to get me through. It would be challenging to break from work midmorning for breakfast. My mornings are often filled with meetings. 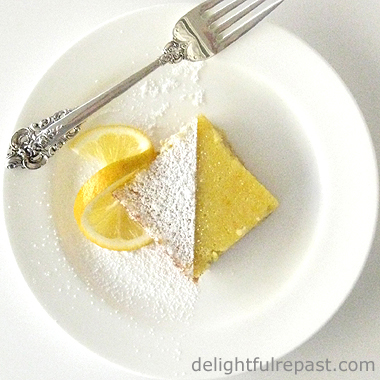 My husband would definitely be grumpy if I backed out of our early evening coffee and dessert. I guess number one (fueling for a workout) would be my biggest concern. Does anyone have any expertise on that? Thanks, Sue. Yes, it sounds like you're almost there on the 16! Christie, I never dreamed I could do my morning workout without some fuel, but I was shocked to see that what I'd read about intermittent fasting was true. I had heard it might take several days to adjust, but it took me no time at all! Amazing. I've listened to a bunch of fitness experts and bodybuilders talk about the benefits of working out in a fasted state--great results, faster. And you can do this on your own schedule, NOT mine, so it really CAN work for anyone. You like your early evening coffee and dessert? And midmorning meal a problem for you? Maybe try fasting from 8pm to Noon! Where there's a will, there's a way, as they say. I've given lots of thought to intermittent fasting over the last few weeks. Like you, I don't believe in short-term dieting, but I do believe in moderation in everything. I have the "no nighttime" snacking under control. My issue is waiting until 10:00 to eat breakfast - I become lightheaded at 8:00. Perhaps filling the "waiting" time with a bit of exercise is the key. Thank you for such an informative and encouraging post! Molly, I was always a believer in the "frequent small meals" idea and would often be hungry and so thought this could never work for me. But I think if you make a point of having a dinner with plenty of protein and healthy fat, and always limit your sugar and starch intake, AND fill those "waiting for breakfast" hours with a bit of exercise, you will SHOCK yourself! Thank you, Molly. I hope you will try it. I think it's one of the best health practices I've adopted! Cherie, I think it's important to sit down at the table together. So when my husband needs to eat later, I go ahead and have my dinner at 5:30. Then I sit down at the table with him later and have a cup of tea or glass of sparkling water while he has his dinner. And this is what I'll do for the rest of my life because it's that important a factor in my health. I'm sure it will help your health as well. Wishing you all the best. Thanks, Debbie. I've read of people who are doing well on the 5/2 IF, but I knew without trying it that it wasn't for me--I need to be on the same schedule 7 days a week. But, hey, whatever works! Hi Jean - I've commented already but I wanted to say thanks again for being a guest on my blog and sharing some of your valuable knowledge. The 16/8 eating plan is definitely something everyone needs to consider - along with reducing sugar and carbs. Leanne, thank you. It was my pleasure. Thank you for including me in your Social Saturdays and for sharing on your SM.